His - Katie & Paul's Big Day! This the tux that all the guys will be wearing. 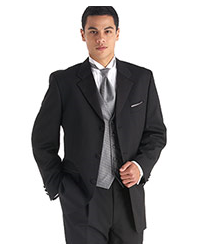 It is the Jones New York Black Three-Button Tuxedo from Men's Wearhouse. The tie and vest will be black and the shirt will be ivory. Why ivory? The salesman at MW recommended that the shirts are ivory since my dress is ivory. If the guys were to wear a white shirt then my dress would look dirty in our photos -- we don't want that!